The East Malling Blog: Tickets please! Are we British obsessed with the weather and the trains? Anyway, as I've waited recently in the glorious sun at East Malling station I often ponder how well the station is maintained, despite the best efforts of some. What caught my eye recently are the new (retro-style) signs replacing the old blue and white ones. What would also be nice are some flower boxes or hanging baskets full of flowers to welcome people to the station, or, as the case may be, send them off. 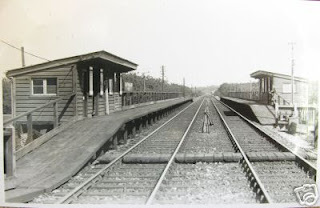 Anyway, if you have an interest in all things train-related, you may be interested in my previous posts on East Malling Halt. 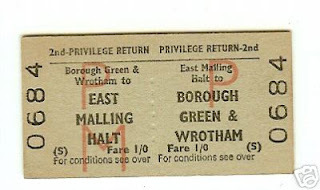 To continue the theme, please cast your eye over the photos above of another view of the old Halt and an old ticket for a journey between Borough Green and Wrotham and East Malling Halt (courtesy of some sellers on ebay). Sadly there are no dates for the photo or the ticket. If anyone has any thoughts, please post a comment on the site. It has been pointed out to me that as there isn't a third rail showing that the photo was taken pre-elecrification. Thanks for you comment and well spotted regarding the third rail. The East Malling page (http://www.kentrail.co.uk/east_malling.htm) on David Glasspool's Kent Rail wesbite notes that the "line was electrified as far as Maidstone East on 2nd July 1939". Thus, we can assume the photo was taken before this. Any furher observations would be appreciated.